A Molly is usually included among the first fish for beginner aquarists. Mollies are often kept in community aquariums, but they are known to nip the fins of species with long and delicate fins and can therefore be a bad choice if you wish to keep such species. Some fish with long and flowing fin will be aggressive, or simply large, enough to fend of an irritating Molly, while others will be much stressed by the harassment and sometimes even die from infected wounds. You can keep a single Molly, but they are more interesting when kept together since you can witness more of their natural behaviour. Mollies will not form schools, but they do develop a strict hierarchy among themselves. The male Molly sporting the most striking colours and largest fins is the alpha Molly. If you keep only one male Molly and several females you will avoid a lot of fighting. You can choose between to major types of Molly; the Short finned mollies and the Sailfin mollies. The most frequently kept Mollies belong to the Short finned group, a group that include well known species like the Black Molly and Gold-dust Molly. Sailfin Mollies have a very spectacular shape and are much larger than the common Short finned mollies. 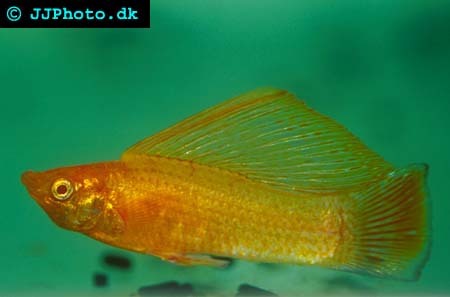 A Sailfin Molly is also harder to keep since it is more sensitive and require more space. A common Short finned Molly will do well in a 10 gallon quarium, but a Sailfin Molly must be kept in at least 20 gallons of water since it can grow up to 5 inches. All Mollies are Livebearers and unlike many fish species, Livebearers do not deposit eggs. A male Molly will instead fertilize the eggs while they are still inside the body of the female Molly, and the eggs will develop into a fry inside the mother. When the fry is large enough, the female Molly will give birth. In the wild, the Molly is found in environments influenced by tidal waves. The environment created by a tropical flood or stream emptying into the sea is a typical Molly habitat. This means that your Molly will do much better if you keep it in a brackish aquarium. Mollies are capable of surviving in a fresh water aquarium as well, but will be more vulnerable to diseases. If you want to keep Mollies with other species, it is therefore recommended to choose other tropical species that tolerate a little salt, such as the Platy. 1 or 2 tablespoons of salt for each gallon of water is suitable. You can buy marine aquarium salt in most pet shops and fish stores. Frequent water changes is a must, otherwise salt will build up in the aquarium. Since the Molly is a tropical fish, the water temperature in the aquarium should be kept in the 75-80 F range. Avoid including driftwood in your aquarium decoration, since driftwood makes the pH lower. Mollies require a pH between 7 and 8. More suitable decorations are plants and rocks. When you decorate the aquarium, leave a larger area of open water for the Molly to swim around in. Your Molly will accept both flake and live foods. A flake food diet should ideally be combined with live food, such as blackworms, bloodworms, grindal worms, fruit flies and brine shrimp. Vegetable matter must be included in the diet. If there are algae growing in the aquarium, the Molly will obtain vegetable matter by eating algae. If there is not a lot of algae for the Molly to eat, you can supplement with Spirulina based flakes or ordinary vegetables such as boiled peas.